In the midst of all the tragedies faced by Palestinians on a daily basis in their homeland, there seems little reason to celebrate anything — and yet they do. After all, the human condition cannot be sustained for long without hope. Hence, 29 November is marked as the United Nations Day of Solidarity with the Palestinian People worldwide — encapsulated on the UN website in the words “Everlasting Roots, Infinite Horizons”. Around the world on this day, people come together in solidarity to uphold the rights of the Palestinian people and to support a future of peace with justice. 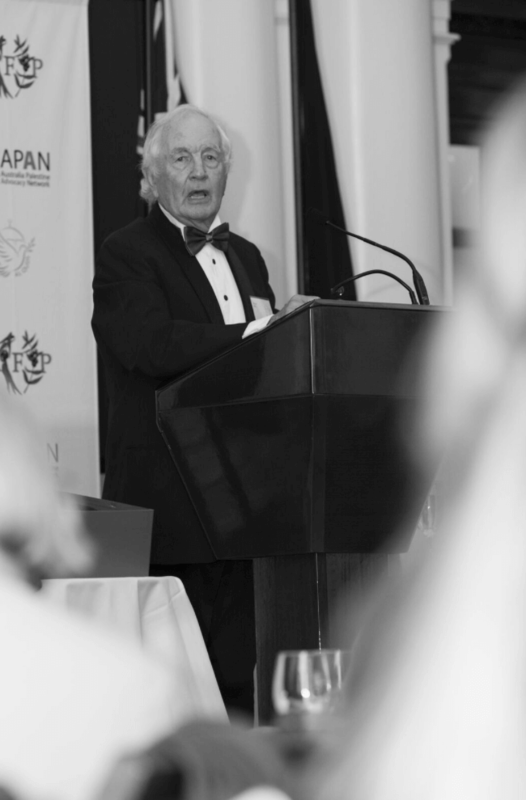 It was, therefore, the most appropriate day to hold Melbourne’s inaugural Jerusalem (Al Quds) Peace Prize ceremony and dinner, particularly as the winner of the prize is one of Australia’s most renowned proponents of peace with justice and an indefatigable advocate for the Palestinian cause — Professor Emeritus Stuart Rees AM. What a night it was in the hallowed halls of Parliament House in Victoria. 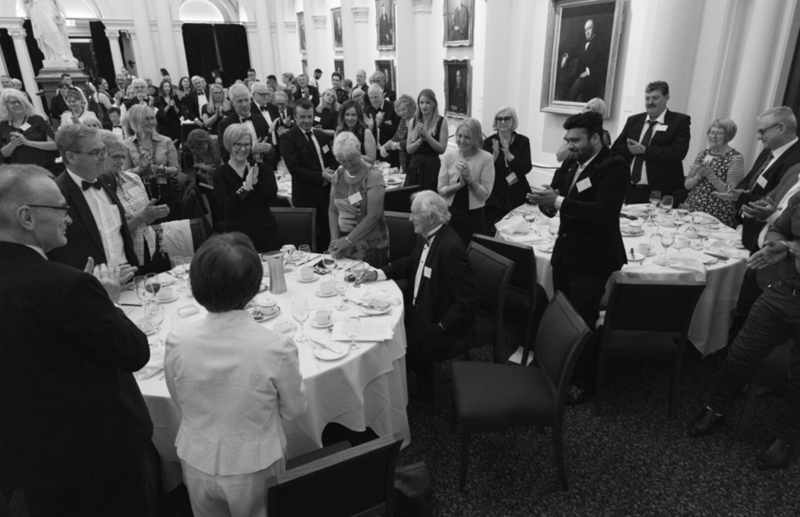 With two former Australian foreign ministers in attendance, many other dignitaries and almost 200 people who had come to pay their respects, it was quite a tribute to the inspirational and extraordinary contributions made by Stuart Rees. Not once, but twice, the entire audience rose to give him a standing ovation. 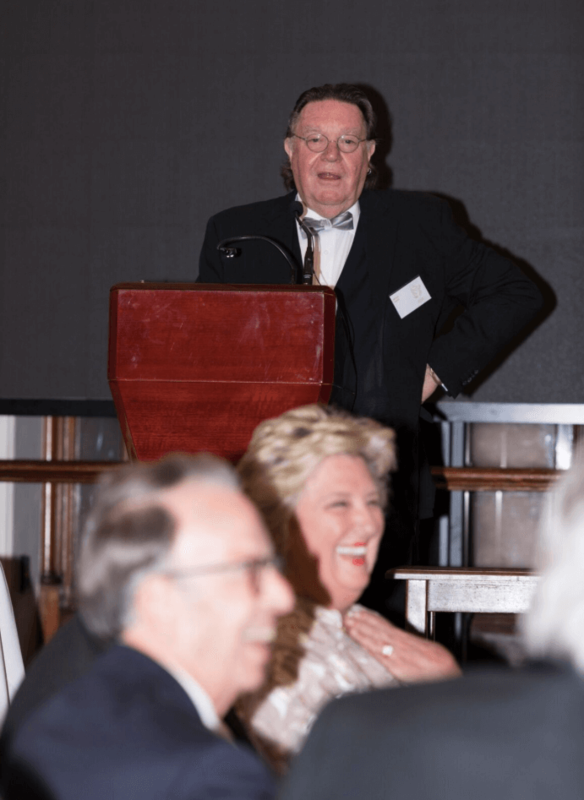 The welcome to country and guests was given by Bryan Dawe, the well-known Australian political satirist and long-time Palestinian supporter. Throughout the night, he managed to raise quite a few laughs about the political conundrums currently being played out in our capital, particularly in foreign affairs — some would say a brave move in the presence of two very experienced former foreign ministers, but then Bryan Dawe is a consummate reader of human frailties. On a more serious note, Bryan talked about the special significance of the night’s ceremony for all Palestinians who hold Jerusalem/Al Quds – the traditional centre of their cultural life – very dear to their hearts. He spoke about how the work of human rights advocates has now become especially critical as Israel pursues its Judaisation of the city, and with some countries, Australia unfortunately being one, contemplating moving their embassies in Israel from Tel Aviv to Jerusalem. These advocates, he said, have done and continue to do some incredible work in Australia to promote the Palestinian cause. 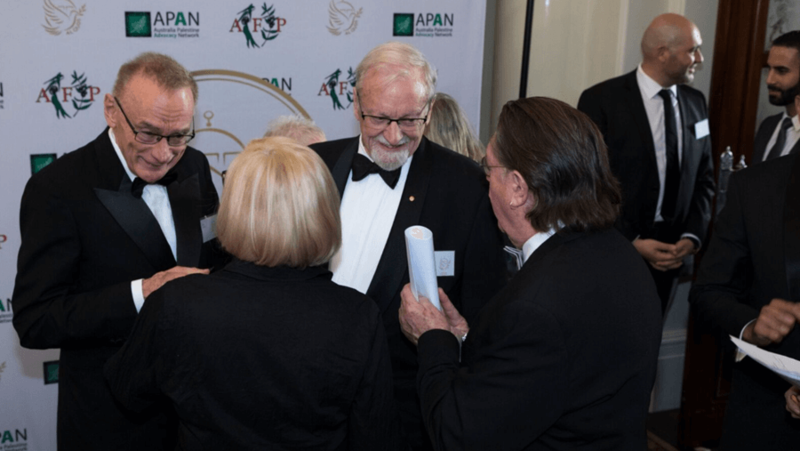 Hence, the decision to award an annual prize to recognise their inspirational and extraordinary contributions as a way of inspiring the community and the next generation of advocates seeking justice for Palestinians. 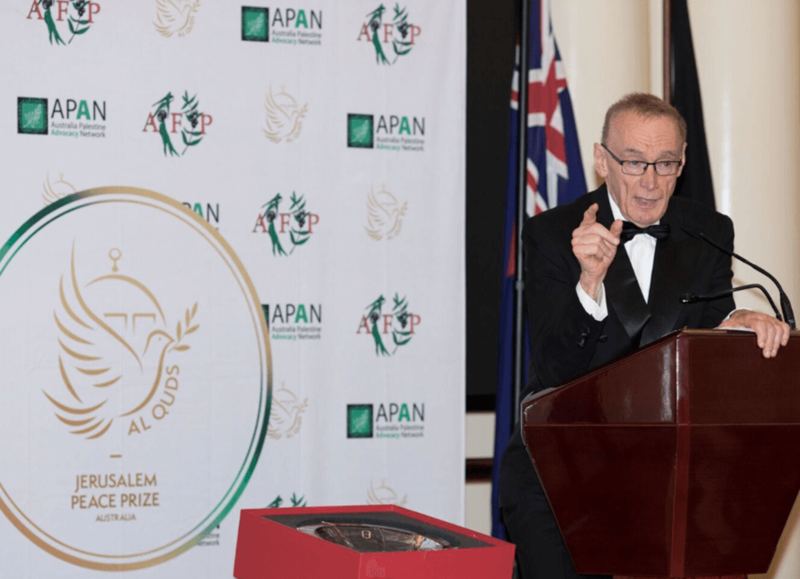 Bob Carr vividly remembered how “all hell broke loose” when Professor Rees had “seduced” him to present the prize to Dr Ashrawi. It was “breathtaking” he said when the University of Sydney administration refused to allow the ceremony and lecture to be held in its Great Hall and he spoke about the pressure brought to bear by the Zionist lobby to get him to pull out of the event. Had he allowed that to happen, it would have been an “act of bastardry”. That is, it would have been tantamount to saying to the Palestinians that they did not have an equal claim to be heard. 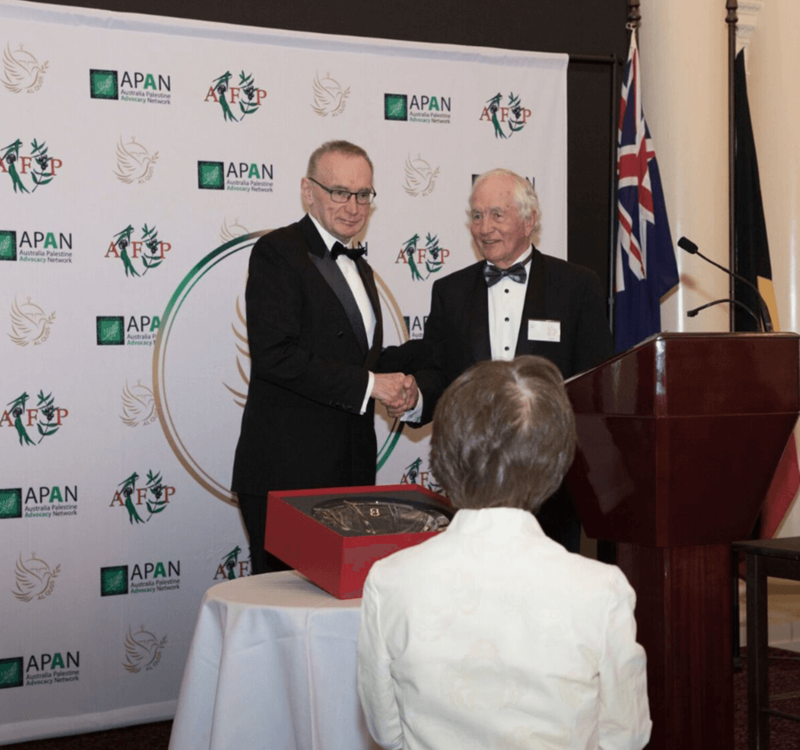 In recognition of Professor Rees’ years of advocacy for Palestine and his pursuit of peace with justice, he was presented with a Baccarat crystal bowl engraved with Jerusalem (Al Quds) Peace Prize 2018 and a cheque for $10,000 — a very small appreciation of Stuart Rees’ years of voluntary service to the Palestinian cause. After the presentation, Stuart Rees began his lecture by referring to Palestine’s national poet Mahmoud Darwish who said he wanted his poetry to influence his people’s national consciousness and thereby help them cope with a military occupation. This, said Stuart Rees, meant the Palestinians and the general public were faced with one of two choices: either engage in a struggle for peace with justice or collude with cruelty. This was the theme of the night’s lecture. Professor Rees’ undiminished pursuit of peace with justice for Palestinians is truly inspirational for any aspirant wishing to follow the same path. He is without doubt an exceptional recipient of the prize. 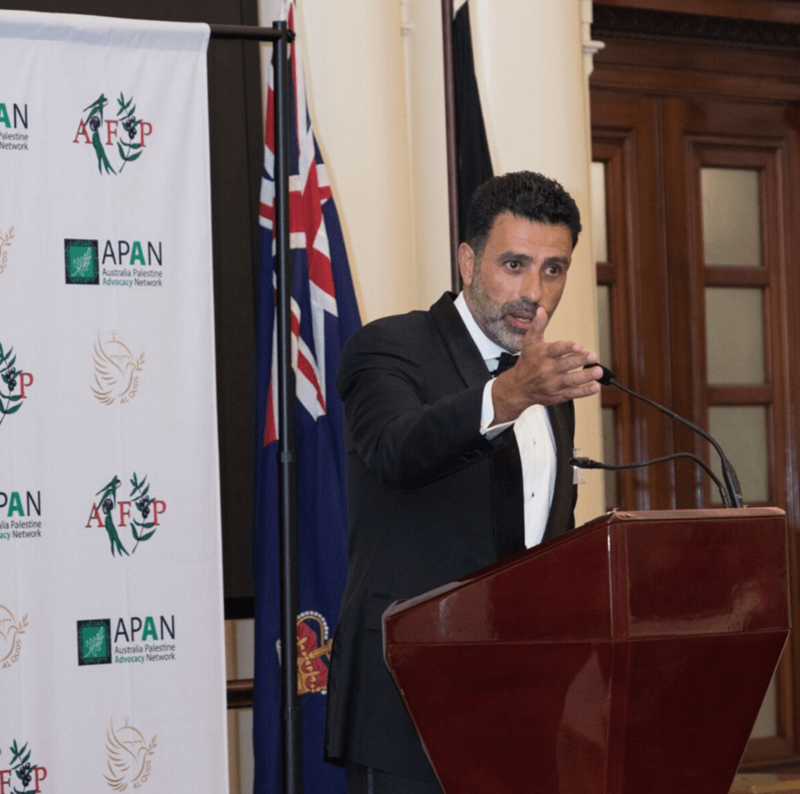 Nasser Mashni thanked the ever-growing numbers of supporters, activists and advocates for Palestine in Australia who give “countless hours”to the cause and also gave a huge vote of thanks to Bronwyn Halfpenny MP who unwaveringly stood firm when some false news threatened the event from taking place at Parliament House. 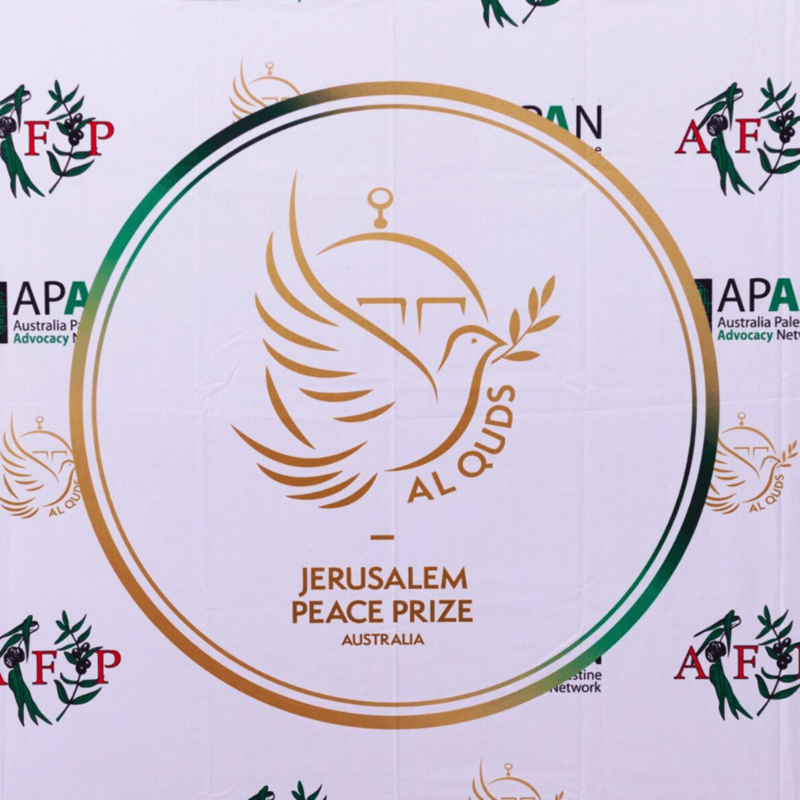 Ultimately, the Jerusalem (Al Quds) Peace Prize — a long time in the planning — is only a beginning in what we hope will build a community of humanitarians in Australia committed to continuing their advocacy for peace with justice for the Palestinian people in their homeland. See Nominations Page for your choice of the 2019 Jerusalem (Al Quds) Peace Prize winner.